By 2022, 143 million homes are set to use voice remote technology globally, up from from 21.3 million today, according to new research. UK analyst group Rethink Technology Research has published a five year forecast on Voice Control of TV entertainment through remote controls entitled “Voice Control of the TV – Decision time for TV operators”. The forecast is by units shipped from 2017 – 2022. 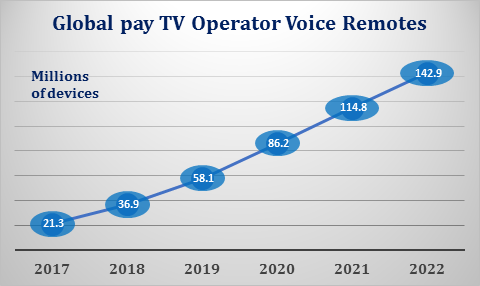 Voice control of pay TV will emerge through a variety of means, but in the first instance near field voice into a remote control is the likely mainstream for a few years. Rethink calculates that some 142.9 million homes (from 21.3 million today) will install well integrated voice technology from an operator by 2022. But voice control of video will by no means stops there, this number is without reckoning on the millions of homes which will opt for voice control either through the remote or a voice assistant for media adaptors (Apple TV, Roku, Chromecast, Amazon Fire TV etc…) as well as smart TVs or through a 3rd party integration with Alexa or Google Voice. Voice is emerging as a battleground where nobody can stay on the sides lines including pay TV and OTT services. The mainstream economic model involves companies like Amazon and its Alexa-Echo language-device combination, operating in a landgrab to capture market share. Eventually the market leader will be able to charge partner companies for using a combination of AI and its natural language engine. Google is hyper aware that it is as much as two years behind Amazon, ceding the period from 2014 to 2016, before it could adequately picture the end-game. At Rethink we believe that voice is like Apple’s AppStore. It acts as a route to market for services, and those services will pay a percentage of revenue to be brought to market via voice. Right now this is a landgrab market where Amazon Alexa wants as many services (Skills) to build momentum, but later we believe it will be in a position to charge services for a service delivery “skill” where it is proactive – for instance offering a cheap taxi ride from Uber, to take you to work because it senses it is raining, and asking for some of the Uber payment. But despite Amazon’s early market lead in voice in the US, pay TV operators globally are trying to compete with it, and Google, Apple and others are trying to make up the huge lead it has achieved in such a short space of time. And this is where Voice Remote Controls come in, and why we have seen a leap to over 21 million voice remotes in the two years they have been widely available (the first Comcast devices came out during 2015). We can picture this rising to just under 143 million with roughly half of them deployed in North America by 2022, with and most of those in the US. This will not represent a massive market financially, which is why we have not forecast this by revenue, but instead by units. Early adopters of Voice TV Remotes include Comcast in the US, in 2015, Dish Networks in January 2017, when it also integrated with Amazon’s Alexa, and AT&T has an FCC filing for a device which will offer this service in early 2018. In Canada, licensees of Comcast’s X1 Xfinity set top have also launched Voice TV Remotes, at Shaw in April 2017 and with Rogers and Videotron due out with a device in early 2018. Telus introduced its own service in Spring 2017 called Pik TV Remote, built using Google Voice, while cableco Cogeco in Canada has its own system built around TiVo technology, likely to use Nuance natural language processing, also due soon. Across the globe there are advanced efforts in France, Switzerland, Spain, the UK, Germany, Italy, Portugal, Japan, Korea and Australia. We go through these in detail in the report and for the most part they are using TV Voice Remotes, and in a handful of cases they also include integration with either generic voice assistants, such as Alexa. Voice remotes will develop first in mature markets where there is high tolerance to additional cost. This amounts to the US first, Western Europe and the richer countries in Asia Pacific such as Japan, South Korea and Australia. The higher the ARPU, the easier is it for a pay TV operator to afford to include it. This is one market where the BRIC (Brazil, Russia, India and China) countries will not lead, at least not during the period of this forecast and these markets are more vulnerable to the Voice Assistant leading the way in pay TV, rather than an indigenous system. For instance in China voice is led by digerati like Alibaba with Tmall Genie, Baidu teaming up with startup iNemo, and Tencent having launched its QRobot and JD (an e-commerce giant worth $60 billion) partnered with Chinese voice expert iFlyTek. Alibaba, Altice, Apple, Amazon, AT&T, Baidu, Bouygues, British Telecom, Comcast, Cogeco, Charter, Cogeco, China Mobile, China Unicom, China Telecom, CJ Hellovision, Cyfrowy Polsat, Deutsche Telekom, Dish Networks, EE, Foxtel, Google, Gracenote, iFlyTek, Iliad’s Free, IPA Technologies, J:Com, KDDI, Kabel Kiosk, Kabel Deutschland, Korea Telecom, Liberty Global, LGPlus, Microsoft, nc+, Netflix, Netgem, Neeo, Nuance, NXP, NOS, NTT DoCoMo, Orange, Portugal Telecom, Pyur (Tele Columbus), Qualcomm, Rogers Communications, Roku, Samsung, SFR Numericable, Shaw, SK Telecom, Sonos, Sony, Spotify, Swisscom, Sky, Telecom Italia, Telefonica, Telus, Tencent, Telstra, TiVo, Uber, Verizon, Videotron, Virgin Media, Vivendi, Vodafone and Xiaomi.